My New Year’s resolution is to have only one project going at a time. And that translates to “finish what you start.” I can be a tad ADD, i.e. “Look at that pretty piece of fabric; I think I’ll sew that today.” And my Very Bad Habit is to throw each new pretty thing onto my cutting table. And the mess begins. If I can stick to my resolution—and 15 days into the year (half a month gone already?! ), so far/so good—I can get rid of the clutter and mess and feel more at peace in my little basement haven. Jas and our travel pals and I had the most wonderful NoCal vacation in September. And one of the best memories is of a sidetrip to Capitola and lunch with one of my cyberfiberfriends, Gayle. To say Gayle offered us lunch is an understatement. Gayle was incredibly generous and opened her home to us and shared herself and her talents (and her very talented and musical husband). I wanted to return her gift in kind. Gayle sews – beautifully. So what could I make to say “thank you” that wasn’t something she could make for herself? The answer came as two lightbulbs went off in my head. Lightbulb #1: While working at the Bernina store, one of my tasks was to arrange all the store samples of bags and accessories onto a wall. 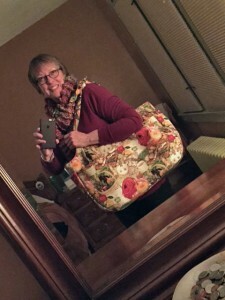 One of the bags was the Amy Butler Reversible Sunday Sling. This is a cool bag—verrry large and perfect for carrying a stash of fabric to a class or a lunch-worth of veggies from the farmer’s market. And did I mention big? The pattern has two sizes and I chose the larger one. I’ve made a number of bags, but I’m never content with the weight of the bag. By weight, I mean the way it will stand when you place it on a table or the floor. I have yet to find the interfacing or inner construction that makes me happy. Amy Butler and her team have hit a home run with this bag, IMHO. Lightbulb #2: On the shelf at the Bernina store, I found the perfect fabric to craft this bag for the consummate foodie. The exterior would be Makower “Cook’s Kitchen,” the interior would be Timeless Treasures’ “Gorgeous Gourds,” with a little accent of P&B Bear Essentials Two Green Bubbles. Were the instructions easy to follow? Yes, but verbose. A lot of reading. What did you particularly like or dislike about the pattern? Loved the stiff interfacing in the base. A sturdy and well-designed bag. The downside is how difficult it is to turn rightside-out when you’ve finished attaching the inside to the outside. Because you’ve got layers of batting and interfacing and stiffener for the bottom, plus layers of pockets, you’ve got a lot of fabric to pull through that small hole. Take a deep breath and take your time. Pattern alterations or any design changes you made: Changed up the pockets somewhat. On one of the outside pockets I added a contrast binding. On the inside big pocket, I added two zippers. I made the tuck in the cell phone pocket smaller, as phones have increased in size since the pattern was designed. For the handles, I cut four of the inside fabric and four of the outside, as I liked the look of the handle matching whichever side is out. Conclusion: Great tote bag, nice design, clear instructions. Makes a wonderful gift for someone you really like. Outside, back view. Contrast trim on large exterior pocket. Inside, look closely to see the cell phone pocket. Inside, full-width pocket, seam up the middle to create two pockets, each with zipper closure. Jan, I’m floored! What a fantastically sweet thing to do. A gift of time and talent is ten times as wonderful as any other gift! Thank you honey bun. I can’t wait to get it. Tell Jas he’s right!